Every fall the Bavarian city of Munich welcomes over six million patrons from Germany and all over the globe to the world’s largest and longest running beer festival – the Oktoberfest. But exactly what is Oktoberfest, why is it celebrated and why is it important? With the generous support of Prost Brewing Company in Denver, Colorado we have rounded-up the key facts to address these questions and more. The brewery has a reputation for making award-winning traditional Bavarian and other German beer styles. We are excited to announce that they are the official sponsor of the Craft Beering 2018 Oktoberfest Bash!! Oktoberfest is the largest annual folk fest and beer festival in the world. It was first celebrated in 1810 and the occasion was a royal wedding that took place on October 12 – the Bavarian Crown Prince Ludwig married Princess Therese von Sachsen-Hildburghausen. The common people were invited to take part in a massive folk fest style celebration which went on for days. Nearly 40,000 commoners participated and the fest was organized as an agricultural show and included horse races. Prior to that royal celebrations did not involve commoners. The festivities were such a success that it was decided that the Oktoberfest will be celebrated each year thereafter. Beer was not served at the festival until 1818 which means that 2018 marks the 200th anniversary of beer served at Oktoberfest! Prost to that! 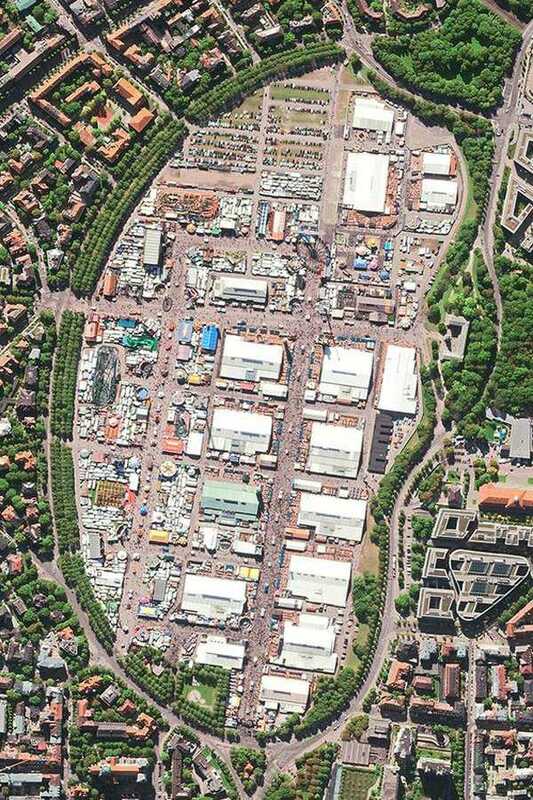 Theresienwiese satellite view || Photo credit: eoVision European Space Imaging. With all the activities going on over the course of the fest, the area where it takes place must be pretty big. It is. Theresienwiese or simply Wiesn is the name of the large grounds where Oktoberfest takes place each year. The word ‘wiesn’ translates to an open grassy area/meadow or simply fairgrounds in English. The area occupies 420,000 square meters in the city center of Munich. This is about the size of 78 football fields – including the end zones! Given its unequivocal name one would reasonably expect that the festival should take place in October. 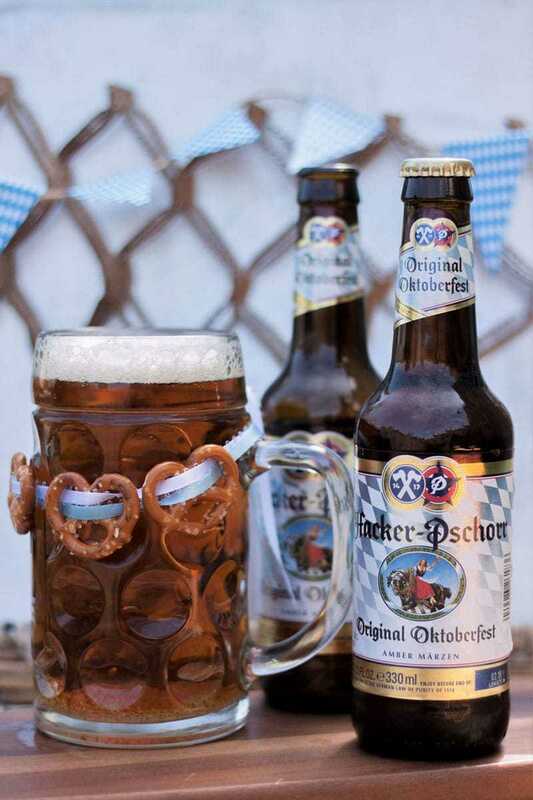 In reality most of the just over two weeks of Oktoberfest are celebrated in September! The reason for Oktoberfest to start in September was inclement weather in 1872 – the start of the fest was scheduled early and has been since but the Oktoberfest name remained. The exact dates and the length of the festival vary each year. The driving date is the first Saturday after September 15 – this is the beginning of the fest. The last day is always the first Sunday of October unless the last weekend of Oktoberfest happens to fall on October 1st or 2nd then the duration is extended to October 3rd, which is a national holiday in Germany. About 8 million liters of beer per fest were consumed at each the few most recent festivals. Oktoberfestbier is a seasonal, deep amber colored lager. Crisp, medium-bodied, flavorful and with slightly higher alcohol content than traditional light lagers. When the first beer stalls were introduced to the festival in 1818, the most famous Munich beer style was known as Bayerische Märzenbier or Märzen for short. Back then, when there was no refrigeration it was brewed in March (hence the name from the German word for that month, Märzen). Subsequently it was lagered in cool cellars throughout the summer and was ready for consumption in early fall. In recent years the Oktoberfestbier has become slightly lighter in appearance from the original copper color (mostly due to mass preferences for lighter lagers). It is especially brewed for the fest by six traditional Munich breweries: Spaten, Augustiner, Hacker- Pschorr, Hofbräu, Löwenbräu and Paulaner. You can read more about the amber lagers of Oktoberfest in our post on Oktoberfestbier vs Märzen. 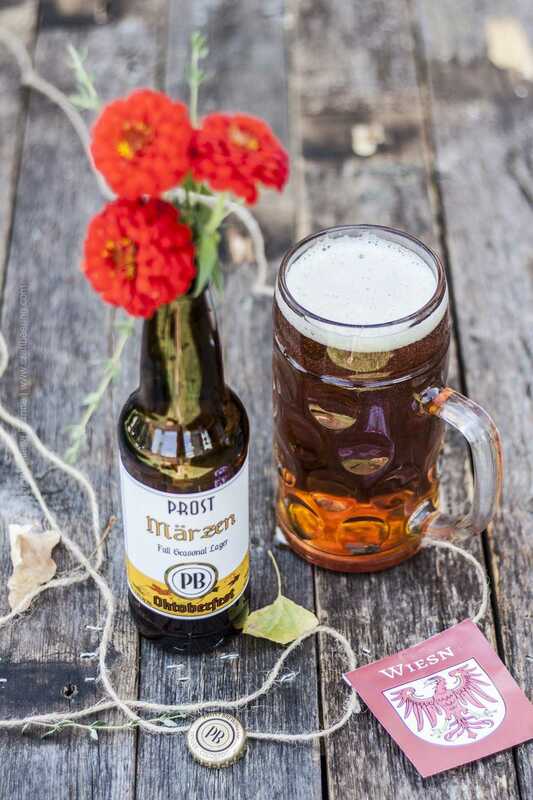 Hint – the seasonal beer Prost Brewing Company makes is an Oktoberfest style or a Märzen style. It is one of the best this side of the Atlantic and hands down our favorite. It tastes insanely good and a few of our German friends have expressed to us how much they like it’s balance, spice and genuine Noble hops whispers. There is a reason it is not named Oktoberfestbier. Find out why. The large dimpled stein (glass mug) in which Oktoberfest beer is traditionally served is known as (Mass) – short for Maßkrug. The word is correctly pronounced with a long ‘a’ sound. Its origins are in the measure word for an old regulation mug – exactly one liter of beer (Maß). Because liter steins full of beer are quite heavy, most people use their whole hand to support the weight of their Mass by threading their palm through the handle and placing the thumb on the other side of the stein. This is convenient and perfectly acceptable. When toasting with a group of other people however, it is better (even though a bit more uncomfortable) to hold the Mass by the handle only. Oktoberfest veterans are sure to do so! The reason is very simple – one’s knuckles and fingers can be easily smashed in an enthusiastic toast involving several toasters. Hold the Mass by the handle and your fingers will be safe from the impact of the multiple heavy steins clinking. 6. No Beer Can Be Served Before ‘O’zapft is’! After beer was introduced to Oktoberfest it was sold at numerous beer stalls. In 1867 a local carpenter and a proprietor of a guesthouse, a man named Michael Schottenhamel, set up the first beer tent in close proximity to the King’s festival tent. It acquired a status of importance over the years. In 1950 the Munich mayor used the Schottenhamel tent as a venue to proclaim the first Oktoberfest ceremony as open. The mayor tapped a vessel full of Oktoberfestbier and proclaimed ‘O’zapft is’ which in Bavarian dialect means ‘It’s been tapped’. This marked the beginning of an important Oktoberfest tradition – no beer can be served before the city mayor taps the first keg and declares the official start of the Oktoberfest. We have rounded up several recipes for the Most Popular Traditional Food served at the Oktoberfest and will be adding quite a few more to the list during the Craft Beering Oktoberfest Bash. There will even be a Schweinebraten recipe with Prost Brewing’s Märzen used as a key recipe ingredient! During Oktoberfest copious amount of Bavarian soft pretzels, Obatzda beer cheese , Käsespätzle, Steckerlfisch (Fish on a Stick), Schweinshaxe (Roasted Pork Knuckle) and Wiesnhendl (Oktoberfest roast chicken) are consumed. There is literally something for everyone, including many vegetarian and vegan options. 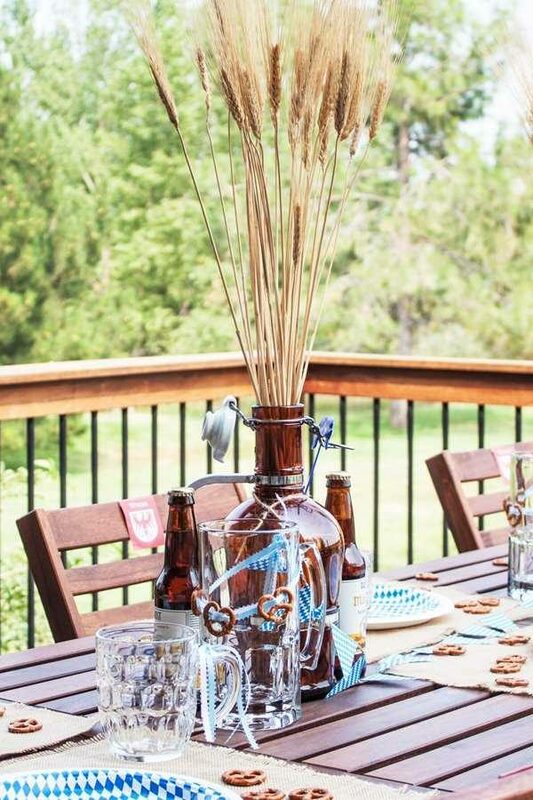 So if you want to have an Oktoberfest party at home – decorate, load up on Märzen and cook up some of the traditional specialties. Today visitors from all over the world enjoy wearing the traditional clothing customarily worn at Oktoberfest and folk fests across Bavaria (as well as Austria). Lederhosen and dirndls abound. This is a relatively new phenomenon however. Initially people attended the fest dressed up in their best outfit – formal dresses and tuxedos were a common sight. Later on clothing standards were relaxed and everyday, comfortable items such as jeans, slacks and t-shirts became normal. Traditional Bavarian costumes were first worn at the fest in the 1960, then increased in popularity and now Bavarian women choose from several dirndls they own and most foreign visitors show up wearing traditional clothing. Fun all around! Did you know that the way a woman ties the apron of her dirndl signals her relationship status? If the bow of the apron is tied on the right side it means she is married (or otherwise taken). Because of the high possibility of undesirable advances by beer emboldened festival patrons, many unmarried ladies whether in a relationship or not intentionally tie their apron on the right. If the apron is tied on the left it means that a woman is unmarried and possibly interested in flirting. A bow tied in the middle front signals a virgin, while an apron tied on the back of the dirndl means that the lady is either a waitress or a widow. Some people say that about every ten minutes the exact same catchy song is played at the Oktoberfest. We haven’t personally timed the intervals, but it sounds correct – that’s how popular the tune is! The most popular song of Oktoberfest is ‘Prosit der Gemutlichkeit”. The refrain goes “Ein Prosit, ein Prosit….” (‘A toast, a toast…’) and you have probably already heard it a few times before. If not, take a listen. Also note the correct way to hold a mass during a toast demonstrated at the end of the video. Only one person got it wrong:). If you want to go – plan ahead. Tents fill up fast and reservations are a necessity, hotels are fully booked months in advance and travel to Munich is harder to arrange for as the festival draws near. Experts say that you should start planning about a year in advance and we agree. Festival veterans advise that you should start by drinking a Radlerbier Mass first and order food before you venture into full scale drinking and dancing. Saturdays at the fairgrounds are the busiest and should be avoided if possible. Things get so busy that you may get the wrong impression about Bavarian hospitality. Weekdays offer best experience for foreign visitors. The largest percentage of foreign Oktoberfest goers belongs to the Italians! They comprise almost a fifth of all international visitors. In fact, the second weekend of the fest is often referred to as the Italian weekend (this is when large crowds of Italians tend to show up). It is on my bucket list to attend Oktoberfest one day! And now I know I might want to go the second weekend and possibly run in to some of my paisano! 🙂 Great post! This is more information than I ever knew about Oktobefest! I’ve never been, but I know that hubby and I would love it – with the food and beer. What a time we’d have! Funny that most of the people that go there are Italians – who would have thought? That apron thing is hilarious! I can definitely imagine most people would definitely show their’s as ‘taken’. Imagine not knowing this piece of information, lol?! And, whoa, that’s A LOT of beer consumed!! Loved this post, guys!! Thank you, Dawn! It is so much fun to go. Amusement park, people watching, delicious food, large beer tents and small outdoor beer gardens and the best atmosphere! Hope you guys go soon.